Arby's now has a new snack item they're calling "Mac & Cheezers." Arby's describes them as "Creamy cheddar cheese and classic macaroni...battered and fried into golden brown triangles of flavor." They sound a lot like Jack in the Box's Cheesy Macaroni Bites. And remember, Pizza Hut now has Bacon Mac 'n Cheese Pasta. 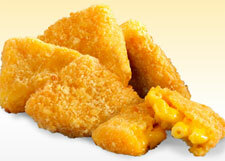 It seems like Mac and cheese is a favorite for fast food to capitalize on this year.